It's in Ted Haigh's Vintage Spirits & Forgotten Cocktails, too, which is where I found it. I was just wondering if anyone has any updates on the availability of Swedish Punsch in the U.S. Does anyone know if Carlshamns Flaggpunsch is available in either Canada or Mexico? I would consider taking a walk across the border if I can pick up a bottle. I haven't been able to confirm if this stuff might be available there, either. The Batavia Arrack Van Oosten is a truly phenomenal, one-of-a-kind product. The truth is, you can mix it with some other ingredients, call it "Punsch", and use it in recipes that call for said Punsch to really fantastic effect. Authentic? I'm no Swede, and I'm not sitting on any vintage bottles. Even if you have absolutely no interest in making Swedish Punsch, do yourself a favor and get some Van Oosten. I was also on the search for Swedish Punsch as a result of the wonderful book by Doc Cocktail when I found this. Perhaps it has been mentioned elsewhere but was surprised it was not in this thread. Note the article, which was written in May 2011, says the new "Kronan" will be available this summer. Well, summer is about gone so I pushed my liquor contact for an update and he indicated it was still waiting for distillation time at the distillery in Sweden. So it presumably is still coming but the timeline for availability is still unknown, at least locally for me. Perhaps someone here has more insight on the status? Meanwhile I continue to search out friends and acquaintances going to London or Europe to try to get some. Thought I had a chance last week for some Carlshamns from London but they weren't able to come through for me. I am not likely to go myself until next summer so if I can't find my own personal Punsch "mule" then I will have to wait for either the Kronan or until I can go myself! I was assured last week that the Kronan, much like T-Pain, is on a boat. You will not be disappointed. I am greatly looking forward to that boat landing! I was able to purchase some Carlshamns Flaggpunsch "on a boat" last spring...specifically, from the the duty free of an overnight car ferry between Göteborg, Sweden and Kiel, Germany while taking our factory-new Volvo over for a test drive on the autobahn. For those waiting on the Kronan, it's (clearly) had countless delays and just now awaiting an open slot for production back in Sweden. I'll post once on the water with more details. Ack, my intel was bad. C'est la bar. It would seem the ship has finally arrived. Kronan Swedish Punsch makes an appearance on an Esquire list and is being featured in the Jan/Feb issue of Imbibe where it is noted to be available at K&L. Doesn't do me much good as K&L won't ship to Georgia. I suspect it is not licensed here either yet although I will promptly start trying to make some waves tomorrow in my ongoing effort to buy everything Haus Alpenz produces (I picked up a bottle of Nux Alpina Walnut liqueur the other day on close out). I see it is also at Astor though so if I have no luck locally I suppose I can bite the bullet and order it there. Will be a good time to sample some of the Bitterman's new spirits as well (which were also featured on the Esquire list of 2011 bottles you will want to try). Anybody else seen it yet? I've been looking forward to trying this and live near K&L, but nobody there seems to have heard of it. Hoping that will change soon. But it is not coming up on the K&L website. It is on Astor though at $30 a pop. Checked and Imbibe does indeed list K&L as the source so that seems a bit odd. Might mention this to them if you go by there again! Contacted Drink Up NY but they indicated they had no plans to add it to their inventory and that the supplier wouldn't sell loose bottles for a special order. Kind of annoying. In fact I don't think I have ever had a shopping list of items that I can't seem to find locally that I can order from a single supplier. There is always at least one thing they don't seem to carry. Just picked up two bottles at Astor. Will report back (not that I really have any frame of reference). Outside chance it will be available in Georgia soon! If not I guess I will have to hope Astor keeps some in stock for the next week or so until I know for sure. I'll chime in as importer for the Kronan Swedish Punsch. It has arrived and is in (or in transit to) New York, California, Massachusetts, Georgia, Colorado, Minnesota, Texas, Oregon, Washington, DC, and some others. A few things to point out on the profile. You won't detect any citrus - the Swedes have a tradition of serving it with fresh citrus (if using citrus at all). So I'd suggest trying it with a squeeze of fresh lime, maybe with a cube or two of ice. The rums and Batavia Arrack are old-school and leathery, each a little different than what's on market today. And as with other Swedish-made Swedish Punsch, the spice element is restrained. If comparing to other current or near current punsches made in Sweden, you'll likely Kronan more flavor intensive than the Carlshamm, Cederlunds, Facile, or the late Groenstadt Blu. Take note that this product improves with age, so consider if comparing with 5+ yr old bottles of Facile or Groenstadt. Excellent! Thanks for the update. Delighted to hear you are including Georgia in the early roll out. I have already placed my order for at least 2 bottles as soon as its available. 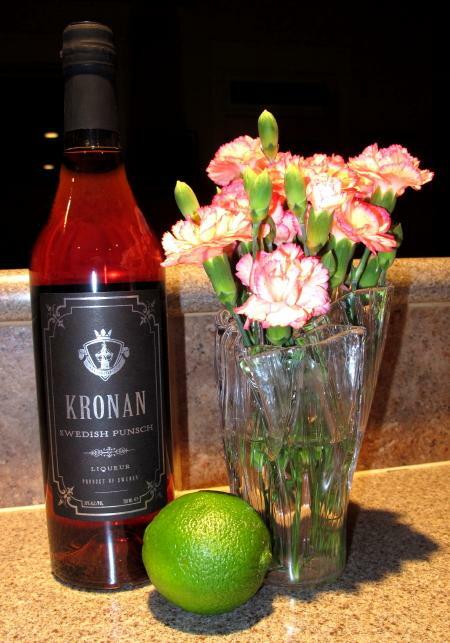 Picked up my Kronan this afternoon and will give it a go as suggested with a bit of fresh lime juice and some ice before any additional explorations are attempted. But a Doctor Cocktail paired with a little additional rum won't be too far behind! Perhaps another good opportunity for the Appleton Extra or the S&C. Now I just have to hope that after 8 or 9 months of trying to acquire some Swedish Punsch I haven't raised my expectations to an unattainable level! I may still pick up a bottle of punsch while in Europe next summer just for comparison. Carlshamns seems to be the brand I see advertised in London most often. Any other brands to be on the lookout for? Started things off with a little pour neat. Relatively low proof at 26% ABV so very easy to drink on its own. Plenty of rum taste to start and yet not so much as the Arrack lends a unique character to the drink. Long pleasant slightly oily finish that was quite pleasant! Next I introduced a bit of fresh lime juice to our new guest in a 2:1 punsch/lime juice ratio shaken with ice and served up. Once again it did not disappoint although it took on a whole new character to me with the lime juice really shining through to make this almost a subtle "limeade" drink (not quite the right description but hard to describe!). Very pleasant although I don't think I would want to use more than a 2:1 ratio. Tonight I hope to pair it up with a rum or two with the lime. I think it could also make a superb old fashioned of sorts when paired with rum, perhaps S&C for a little bite. Will probably also try the Appleton to see what if any differences I can find. Doesn't seem likely to need sugar so perhaps a dash or two of orange bitters and a lime twist over a big cube of ice would be perfect. Ah, it's in stock at K&L. Will pick up a bottle on Friday. Is the sugar content of Kronan consistent with traditional Swedish Punsch? I was hoping to enjoy it straight, but it's way too sweet for my (perhaps overly sensitive) unsweet tooth. Does anyone have a good recipe yet for bumping the alcohol up and sugar down? I'm thinking some combination of Smith & Cross, another mild Jamaican rum like Appleton's, and a bump of Batavia Arrack. if i come across a bottle, i can calculate the sugar and maybe come up with a conversion to other standards like lillet or sweet vermouth. "punsch (schwedischer) 1.1030 26.3% 332.0"
I was under the impression (from reading Wondrich) that it's supposed to be too sweet on its own. That's why it's diluted with water to make punch, or treated as a liqueur for cocktail applications. It is quite sweet. Then again I like sweet. With a 2:1 ratio with lime juice it was a bit like a really funky limeade. I liked it but it might not be for everyone. I did try just a wee nip straight up and it was nice enough but not sure I would want to drink a lot of it that way. I also liked it well enough to get a second and third bottle to put away for the future in case it proves hard to come by down the road! I think tonight I will make a small portion Doctor Cocktail with S&C and one with Appleton Extra for a "taste off". I am also curious to test Ted Haigh's assertion that it can make a lesser rum shine. I have a bottle of Brugal gold which is OK but nothing special so maybe I will add that to the taste test tonight and see!